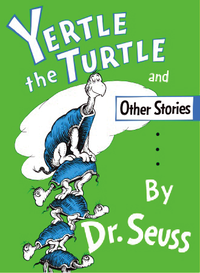 Squandermania and other foibles: Which one is Yertle? One notes that Christopher Carroll at FT has borrowed the "turtles all the way down" framework one may have encountered a few months ago here on this humble site (or again in the current issue of The Believer) — and, having made off with the structure as if it were his own, has grossly misapplied it. Mr. Carroll, the Fed is not the bottom turtle, even if one is speaking of the financial sector. I assure you that if we are indeed concerned "to make sure that the bad loans do not bring down the whole stack of turtles," the bottom turtle in that case still must be where value enters the economic system, not some institutional body within it. They aren't "bad loans" in the first place unless something has happened in the circuit of labor, pay, and production. As well to think that the bottom turtle of the educational system is the scholarship office rather than the students. You should hang out with students more.